(Trent Nelson | The Salt Lake Tribune) Utah Royals FC host North Carolina Courage, NWSL soccer at Rio Tinto Stadium in Sandy, Friday July 20, 2018. Utah Royals FC midfielder Katrina Gorry (19) and North Carolina Courage midfielder Denise O'Sullivan (8). 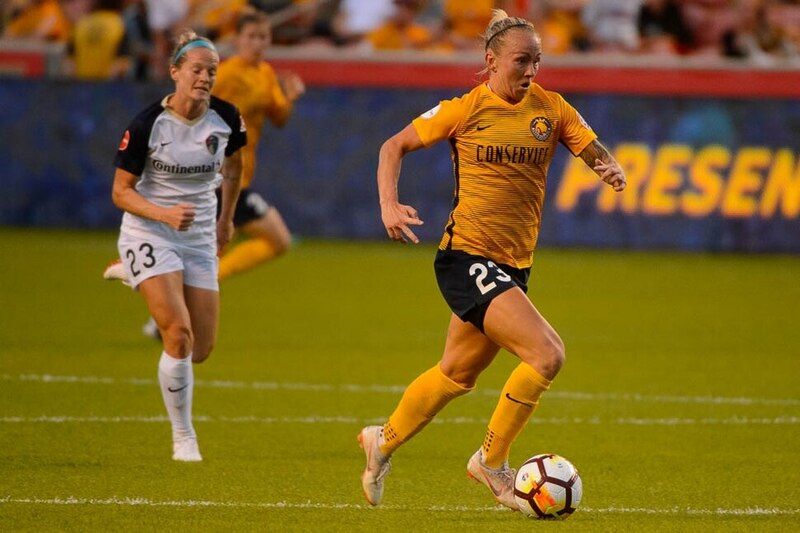 Sandy • The Utah Royals most likely won’t make the playoffs in their inaugural season in the National Women’s Soccer League, but at least they can always claim the season series against the league’s best team. Missing three key players who were called up for U.S. women’s national team service earlier in the week, the Royals battled to a scoreless draw with league leaders North Carolina on Friday night in front of an announced crowd of 8,529 at Rio Tinto Stadium. The Courage were also without six U.S. national team players, but it will go down in the books as a satisfying result for the home team. (Trent Nelson | The Salt Lake Tribune) Utah Royals FC host North Carolina Courage, NWSL soccer at Rio Tinto Stadium in Sandy, Friday July 20, 2018. Utah Royals FC midfielder Gunnhildur Jónsdóttir (23). 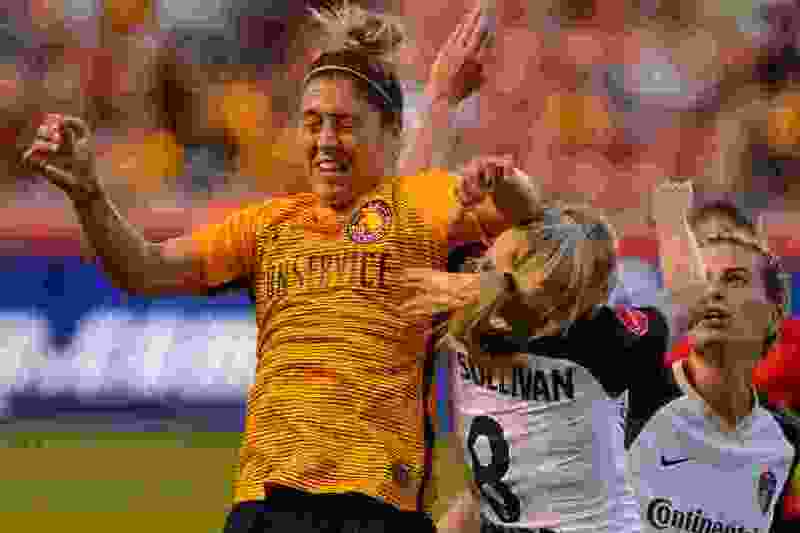 (Trent Nelson | The Salt Lake Tribune) Utah Royals FC host North Carolina Courage, NWSL soccer at Rio Tinto Stadium in Sandy, Friday July 20, 2018. North Carolina Courage forward Jessica McDonald (14) and Utah Royals FC forward Katie Stengel (24). Utah Royals FC goalkeeper Nicole Barnhart (18) at rear. (Trent Nelson | The Salt Lake Tribune) Utah Royals FC host North Carolina Courage, NWSL soccer at Rio Tinto Stadium in Sandy, Friday July 20, 2018. North Carolina Courage defender Abby Erceg (6) heads over Utah Royals FC midfielder Diana Matheson (10). (Trent Nelson | The Salt Lake Tribune) Utah Royals FC host North Carolina Courage, NWSL soccer at Rio Tinto Stadium in Sandy, Friday July 20, 2018. Utah Royals FC midfielder Katrina Gorry (19) and North Carolina Courage midfielder Denise O'Sullivan (8). (Trent Nelson | The Salt Lake Tribune) Utah Royals FC host North Carolina Courage, NWSL soccer at Rio Tinto Stadium in Sandy, Friday July 20, 2018. Utah Royals FC midfielder Katrina Gorry (19) and North Carolina Courage midfielder Denise O'Sullivan (8). (Trent Nelson | The Salt Lake Tribune) Utah Royals FC host North Carolina Courage, NWSL soccer at Rio Tinto Stadium in Sandy, Friday July 20, 2018. Utah Royals FC midfielder Gunnhildur Jónsdóttir (23). (Trent Nelson | The Salt Lake Tribune) Utah Royals FC host North Carolina Courage, NWSL soccer at Rio Tinto Stadium in Sandy, Friday July 20, 2018. Utah Royals FC midfielder Diana Matheson (10) and North Carolina Courage goalkeeper Katelyn Rowland (0). (Trent Nelson | The Salt Lake Tribune) Utah Royals FC host North Carolina Courage, NWSL soccer at Rio Tinto Stadium in Sandy, Friday July 20, 2018. Utah Royals FC midfielder Diana Matheson (10) reacts to an offsides call. (Trent Nelson | The Salt Lake Tribune) Utah Royals FC host North Carolina Courage, NWSL soccer at Rio Tinto Stadium in Sandy, Friday July 20, 2018. Utah Royals FC midfielder Diana Matheson (10) goes around North Carolina's Cari Roccaro. (Trent Nelson | The Salt Lake Tribune) Utah Royals FC host North Carolina Courage, NWSL soccer at Rio Tinto Stadium in Sandy, Friday July 20, 2018. Utah Royals FC midfielder Katrina Gorry (19) and North Carolina Courage midfielder Denise O'Sullivan (8). (Trent Nelson | The Salt Lake Tribune) Utah Royals FC host North Carolina Courage, NWSL soccer at Rio Tinto Stadium in Sandy, Friday July 20, 2018. Utah Royals FC midfielder Katrina Gorry (19) and North Carolina Courage midfielder Denise O'Sullivan (8). Being the only team not to lose to North Carolina this season “is a big statement,” said Utah coach Laura Harvey. So Utah wins the season series, having taken five points in the three matchups. The Royals remain the only team to have defeated the Courage this season. Utah took a 1-0 win on June 16 at WakeMed Soccer Park in Cary, N.C. Drawing with the Courage is saying something, because N.C. has dominated everyone else in the NWSL. Since losing at home to Utah, the Courage have outscored opponents 17-2. All told, N.C. has scored 41 goals and given up 14. So the Courage moved to 14-1-4, while URFC stayed in sixth place with a 5-6-7 record and 22 points. Utah is on a four-match winless streak, having lost three straight before Friday, but Harvey was mostly positive in her assessment of the performance. The Royals’ last win was a 3-1 victory over Sky Blue FC on June 30. The first half was rather uneventful, with North Carolina controlling possession and getting four corner kicks to one by the Royals. 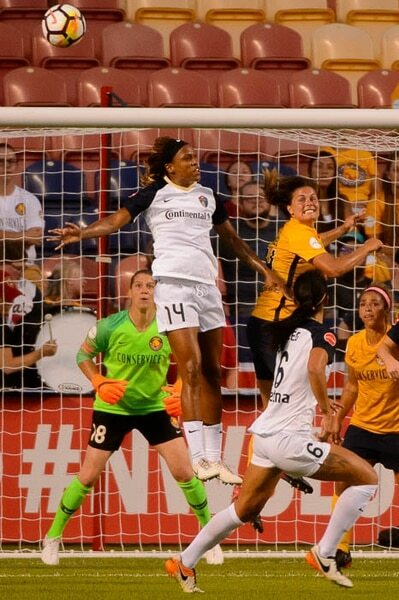 The Courage’s best scoring opportunity in the first half came early, as Lynn Williams took a header after a corner kick that was stopped by Utah goalkeeper Nicole Barnhart, who made her first start of the season in the place of Abby Smith, who took a hard fall in last Saturday’s 2-1 loss to Orlando and missed Friday’s game. “We are so lucky to have Barny — I’ve said it all season,” Harvey said. The Royals played without forwards Christen Press and Amy Rodriguez and defender Becky Sauerbrunn, who were also called up to represent the U.S. for the upcoming Tournament of Nations. North Carolina controlled possession 57 percent of the time in the first half, and nearly 60 percent in the game, even without stars Abby Dahlkemper, Jaelene Hinkle, Merritt Mathias, Samantha Mewis, McCall Zerboni and Crystal Dunn. North Carolina outshot Utah 20-5 and had eight corners to Utah’s five. “I don’t know that we’ve had more than five shots in any game we’ve played against them,” Harvey said. The Royals signed former BYU forward Colette Smith and former Weber State goalkeeper Becca Ritchie earlier in the week, but neither local saw action Friday. North Carolina’s roster includes former Riverton High star Darian Jenkins, a UCLA product who entered the game in the second half.